Labour will not support any Brexit deal that includes a return to a hard border, Jeremy Corbyn will say later.Mr Corbyn is making his first visit to Northern Ireland since he was elected as Labour leader three years ago. He will make a speech at Queen's University in Belfast to insist he will not tolerate a hard border between NI and the Republic of Ireland.Potential disruption to cross-border trade is crucial to the overall state of the Brexit negotiations. The UK and EU have agreed that there will be no hard border, but are at odds on how to achieve that. A major sticking point is what arrangement will be put in place if the border cannot be solved in an overall deal.The two sides accept the need for a 'backstop' but differ on how it should work.Mr Corbyn will suggest that Labour's proposal for a new comprehensive EU-UK customs union has the potential to prevent communities in Northern Ireland being divided. The Labour leader will also argue that maintaining an open border is not just about avoiding paperwork or tariffs, but serves as a symbol of peace. He also wants London and Dublin to revive the British Irish Intergovernmental Conference in an effort to break the deadlock at Stormont.Northern Ireland has been without a government since January 2017, when power-sharing between the Democratic Unionist Party (DUP) and Sinn Fein collapsed. What is the BIICDuring Mr Corbyn's two-day visit to Northern Ireland, he will also meet with business leaders in Belfast and Londonderry to discuss their concerns around Brexit. By Jayne McCormack, BBC News NI Politics ReporterAll eyes will be on Jeremy Corbyn when he touches down in Belfast later.The last time he visited Northern Ireland, in 2015, he was still a candidate for the Labour leadership.Since then, the political landscape has been turned on its head because of Brexit and the ongoing impasse at Stormont.Now the leader of the opposition, Mr Corbyn will attempt to address both of those issues in his speech at Queen's University, before fielding questions. His decision to visit points to the importance of solving the Irish border issue.His call for the British Irish Intergovernmental Conference to be revived puts the focus back on Theresa May's government, which some Northern Ireland politicians criticised recently for not doing enough to help restore power-sharing. 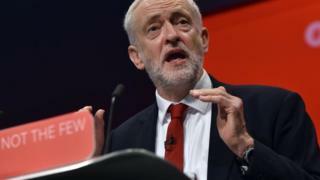 Earlier this week, the Labour Party in Northern Ireland said it was disappointed that Mr Corbyn had not made plans to meet them during his visit.A Labour source said the party was in communication with Labour NI and would "be in touch to arrange a future meeting".People in Northern Ireland have been allowed to join Labour since 2003, and they have had their own constituency branch since 2008. Whether they can contest elections is currently subject to an internal review, which is understood to be in its final stages, but any decision to change the current policy would need to be taken by Labour's National Executive Committee (NEC). » Q&A: Could US-Canada border solve Irish dilemma?